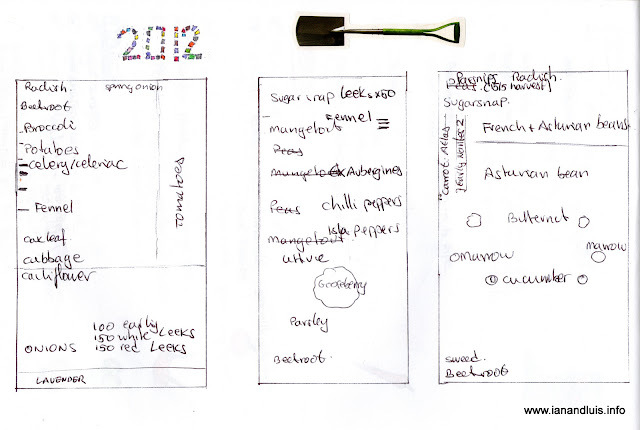 Since we first started growing vegetables at La Pasera we have always made notes on what was grown where and when. As the beds have developed, we have kept small diagrams of them with brief notes indicating crops. Salad crops and spare seedlings are often put in empty spaces in-between the main crops. I suspect that as we don't grow mono-crops, crop rotation makes very little difference but we do it anyway. Unfortunately we don't produce enough home-made compost to replenish the beds on a yearly basis nor do we have a great supply of manure but the compost, manure, leaf mould, ash, and green manure that we do have access to seem to keep the beds in good condition and healthy. We try and remain organic in our approach to food production and will only use natural pest controls and organic products on the garden. Where possible we make our own including nettles or comfrey as a natural fertiliser, garlic and soap spray, rhubarb leaf and horsetail concoctions for insecticides and fungicides. It's all a question of balance at the end of the day. Our methods try and encourage natural cycles, attempt to promote the natural food chain and do as little harm as possible in doing so. A healthy garden is one that works with nature not against it. We encourage the birds and we have created a range of habitats for insects, amphibians and small mammals. The pond, fedge, wild areas, woodpiles and bog garden all contribute to the control of pests to maintain and nurture a natural balance. We are lucky with the climate here in Asturias as it is mild enough on the coast to grow throughout the year. The recent addition of sandy topsoil and making raised beds has been a real help in producing all-year-round crops as we are no longer struggling with clumpy clay which inhibited winter crops. This year we are expanding our companion planting as last year's efforts seemed to pay off. We will plant nasturtiums amongst the beans to attract the black fly, carrots amongst the leeks and onions and marigolds for general help. We might try some borage but I doubt if we'll manage to source it here. Do you have any tips on companion planting? What grows well with what? Get in touch or send us a link, we welcome tips and experience. February has been a mixed month weather wise with significant rainfall, beautiful and warm spring-like days and spells of cold and damp. A dusting of snow has settled on the mountain but we remain frost and snow free being so close to the coast. We have made the most of the better weather to catch up with a few jobs around the plot and begin preparations for our spring and summer crops. In November last year we sowed oats as a green manure in one of our larger beds, this has now been turned over ready for planting in a few weeks time. Potatoes were chitted (100 Mona Lisa) and have been planted in the smaller of our beds together with a good helping of home-made compost from one of our bins. Peas, sugar-snaps and mange tout have been germinated and planted and are growing well. We used the pea sticks gathered from our hazel trees which have been coppiced. The remainder of the wood will be used for firewood and to add to the fedge (hedge/fence) which is a great habitat for stag beetles, slow worms and amphibians. We have replanted the herb garden now the hard landscaping is in place and it will come into its own later on in the year - watch this space. The rhubarb is coming through and it is likely we will have enough to harvest in early spring. Three mosaics Luis made a couple of years ago have finally been sited in front of the garden shed and are looking great. Elsewhere in the vegetable garden we are still cropping early broccoli, leeks, celeriac, fennel, swede, beetroot, cabbage and winter lettuce. The beetroot are a bit tasteless but we have discovered a recipe for chocolate brownies using beetroot as a base and they are wonderful. There are many pepper varieties to chose from. Here at La Pasera we tend to concentrate our efforts on those varieties that grow well during the humid Summer months we get so close to the coast. The peppers we grow are old varieties traditionally grown on the north coast. Isla peppers is a variety that originates in Cantabria and produces rather fleshy and very sweet fruits even before they ripen and become red. The other variety is a very mild and pleasant chilli pepper called Guernica from the Basque country; delicious even raw. This year we were given some Cayenne peppers for us to germinate that we intend to dry and use in cooking. We like our peppers and have fine-tuned the variety and methods by which we grow and preserve them. Peppers are slow to germinate and more so this early in the season without a heated propagator or greenhouse. Our pepper season commenced a few days ago when we started germinate the seeds by soaking then in water for 12 hours after which we cover then with a wet tea towel in a closed plastic container. We wait until they start showing signs of sprouting before sowing in compost and placing against a warm and sunny wall. We grow enough plants to provide us with fresh pepper for use in cooking and to eat raw when in season during late Summer and early Autumn. With the glut of chilli peppers and ripe Isla peppers we bottle some and dry the remainder to use in stews, salads and cooking throughout the year. To pickle the Isla pepper or any other red and fleshy varieties you need to fill the jars with the washed and cut pieces before filling up the jar with a pickling fluid containing 4 table spoons of vinegar and 2 table spoons of sugar per litre of water to which we add spices to taste. Making sure the peppers are fully covered, seal the jars and Bain Marie for 15 minutes. Once cool, store the jars in a cool dark larder and use over the next 12 months. To pickle the chilli peppers: To vinegar add a few pepper corns, cloves, coriander seeds, cumin seeds, paprika and some olive oil. Bring to the boil for 5 minutes. Then scald the chillies for about 1 to 2 minutes depending on how tender they are. Drain and bottle without cooling them. Fill up the jars with 3 parts of the boiled vinegar and 1 part of boiled but cold water and cover the peppers completely and start using after 1 month in storage. No need to preserve using a Bain Marie. They can be used in cooking or eaten straight from the jar as an accompaniment with hearty soups or with salads. It's that time of the year again when we announce the dates for our course on weaving a chair seat. This is the 4th year we have run the course and it is growing both in reputation and popularity. The course takes place in Spain at our workshop in Asturias. There will be a maximum of 5 participants on each course to ensure quality tuition from the instructor Luis Laso Casas. The cost of the course is €200 - advice about hotels or accommodation is available upon request. Es un plaer el poder compartir mi experiencia y conocimientos con quienes esteis interesados en descubrir una artesania tan bonita como es la rejilla o esterillado frances a traves de los cursos que detallo acontinuacion. Es un curso practico en durante el cual los participantes aprenden las tecnicas necesarias para poder tejer artesanalmente asientos de rejilla usando tireta de rattan. Las tecnicas que imparto estan basadas en las tecnicas britanicas las cualesnos permiten tejer la rejilla con una mayor durabilidad a la hora de ser usada que las conocidas como tecnicas continentales. Al final del cursillo, los participantes habrán tejido artesanalmente un asiento usando junquillo o tireta de rattán. €200.00. La matrícula incluye todos los materiales necesarios, las tres comidas principales basadas en una cocina vegetariana y bebidas no alcohólicas durante el día. Puedo facilitar una pequeña lista de hoteles cercanos donde los participantes puedan alojarse durante el cursillo. Un deposito de €50.00 debe ser abonado para asi reservar un puesto. El número de plazas está limitado para garantizar un mejor aprendizaje. If you follow our blog you will know we have been making hand cream and soap for some time. We use natural products and oils that carry essential oils from plants we grow in our garden here at La Pasera. Moisturising makes sense as it maintains the skin's integrity and helps prevent damage from the sun. The cream we have been making is based on olive oil infused with lavender and almond oil with calendula; anyone interested in the process involved to infuse oils can email us or look out for a future blog entry on this subject. The hand cream we have previously made is based on bee's wax but it is difficult to apply on your face or as a body moisturiser This is because this cream is based on oils and waxes dissolved in water without using emulsifiers. I have been interested in learning to formulate lighter moisturisers and body lotions for some time and had the opportunity to attend a course on "Natural Cosmetics". It was very interesting and has equipped me with the required knowledge to formulate different creams that can be used on different skin types of for different purposes. Very exciting. Today I want to tell you about a light and nourishing body lotion that I made based on my own formulation and following the theory I learnt during the course. One of the main difficulties making skin products is ensuring the stability of the creams so that it does not separate as we try to mix oils and water (known in the industry as the hydro-lipid balance). The use of emulsifiers such as quitine and lecithin will help overcome this. Oil and water don't generally mix unless emulsifiers are used. Working out the required formulae so that the oils and fluids mix well and remain stable without going off in a short time is what attracts me to this subject. The use of appropriate emulsifiers ensures our cream will remain stable while the use of essential oils with antiseptic properties (e.g. lavender) will ensure bacteria does not grow in it and that we are able to use it for for several months. We prefer to use it fresh and never lasts longer than 10 weeks and still remains fresh. The first of these body lotions we recently made is so light that can also be used as a facial moisturiser It has a light consistency and feels like a mouse while providing good skin hydration. The formula to make this recipe will be based on 1000 gr of which 30% of its weight will comprise the oils and emulsifiers (oily phase) while the remaining 70% will be made up by water and glycerin (the aqueous phase). The process involved requires melting together all the oils and emulsifiers in a glass bowl using a Bain Marie while the aqueous phase (water and glycerine needs to be heated separately The temperature of both containers needs to be between 60 and 65 Celsius. If we have no thermometer to measure the temperature, we will ensure the oils are heated up until they melt completely and are thoroughly mixed before we slowly start adding the water and glycerine heated until it nearly reaches its boiling point. Once the oils are slowly mixed with a hand whisk (a similar process to making mayonnaise), we continuously stir until the mixture has completely cooled down and is poured into containers. If our formulation is correct and we have followed the right method, the cream will not separate into water and oils and will have the desired texture. Let us know how you get on or if you already make such creams let me know your recipes. This is our personal recipe and we do not advocate using it unless you are satisfied it is safe. 7 drops of essential oils according to preference and taste but ensure one of the oils has antiseptic properties and that will be our preserving substance. *Please note that the liquids are measured in weight for this recipe. One thing I never knew before visiting Asturias is that Kiwi fruit grows exceptionally well here, so much so that there are several small scale producers and many small holding or larger garden that have a few vines. Another thing I never reckoned on was the range or varieties there are and how different each one is. Each year around this time we buy a fair few Kiwis via Nigel from the Hotel Posada del Valle and his contact with a consumer group who source locally grown produce. The ones we buy are from a local organic kiwi producer who grows a lot of different varieties. In fact we've walked many times through the farm as it is on the way to the route of the watermills near Cuevas. This year we bought 15kg in total but some of them were for our neighbour who likes to make kiwi jam. At 1.80€ per kilo we were pleased with the quality. This year's crop are large, sweet and when ripe, extremely juicy. I like to eat mine like a boiled egg, cut the top off and scoop out the bright green and juicy flesh, Luis carefully peels his and eats slice after slice until it's all gone. How do you eat yours? Herbs are an important part of our food here at La Pasera so when we were planning the garden we decided to try and build a functional herb garden close to the house so that they could be harvested and used fresh. The main herbs we use are: Lemon verbena, thymes, sages, mints, lemon balm, chamomile, chives and oregano, all of which were ideal plants for siting at the front of the house and with in easy reach of the kitchen. We also grow many others but experience has shown they grown better elsewhere: coriander, parsley, basil, dill and rosemary. As you all know Luis makes some wonderful mosaics and over the past few years we have amassed a good collection of 30 sq cm mosaics which are ideal for stepping stones. Together with a semi-circle sun, we came up with this design for the herb garden. It allows us easy access to the different beds and also gives access to one of the garden taps which also has a small mosaic terrace featuring dragonflies. The herb garden also has two rhubarb plants, two young peach trees and at the moment a couple of misplaced fuchsias which are still there from when we used the bed as a nursery bed when we first moved here. The herb garden will be re-planted and plants will be moved once the rain ceases. We will also allow a few marigolds to grow as we use the petals infused in oil for various creams and potions. Each year in winter the beach at Santa Marina, Ribadesella becomes littered with tonnes and tonnes of driftwood and river wood. It is an amazing sight. After the pristine sand that the beach presents us with for 10 months of the year, from now until Easter time, the beach is awash with wood. Most of the wood comes down the Rio Sella during periods of high tides, heavy rains and rising river levels. Other rivers and tributaries also contribute their fair share of wood in its many forms. There are however, some strange and incongruous finds that tell another story. This week we made a trip down to the beach with the specific intention of finding wood to replace the cat's scratching posts that we have in the garden. The existing ones were originally from the beach a few years ago but with lots of use and natural decay they needed replacing. Needless to say we had a lot to choose from. Amongst the detritus washed ashore were single flip-flops, plastic bottles, way too many plastic bottles, a pair of badly scratched Tommy Hillfiger sunglasses, a yellow rubber duck and too many pieces of cast-away rubbish. This year we have seen many more local people collecting firewood from the beach, a good use for it for those who are able to process it. Our finds included several pieces of oak and chestnut that we will use for mosaic art, a carved and decorated piece of a grain store (Horreo) about 150 years old we think, a piece of oak with a carving of a bear stood on a rock, two fine scratching posts, a weathered and characterful plank and a well-washed and almost polished tree-stump. We will find uses for all this reclaimed treasure and enjoy it in the process. Beach-combing, well wrapped up on a fine winter's day, there is nothing better. We may be back for more, we have until mid march when it is cleared by the local council in readiness for horse racing on the beach that takes place around Easter-time.